Fashionistas take note: Bathing suits have come a long (long) way since the early days of beach dwelling. 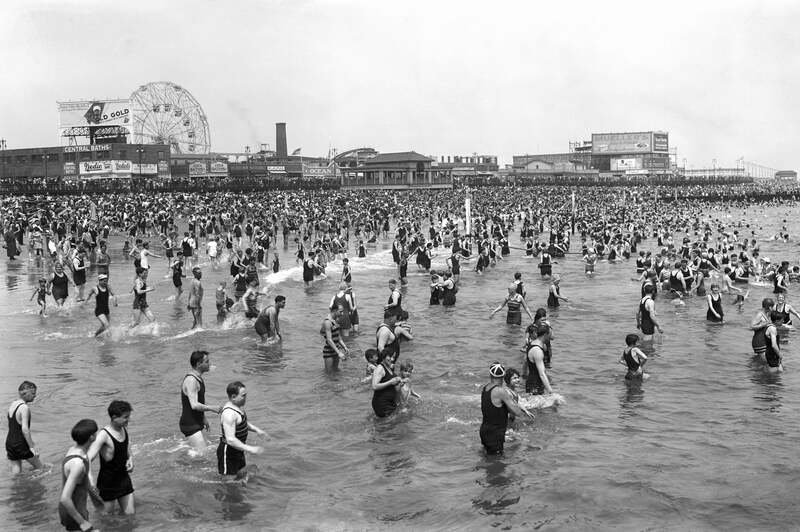 This throwback snap from 1928 of New Yorkers wading in Brooklyn’s Coney Island beach shows just how much swimwear has evolved. Still, there’s something absolutely innocent and joyful about this photograph — indeed a reflection of simpler times. The famed Wonder Wheel in the background only adds to the cheery nostalgia on what was presumably a steamy summer day — not unlike today. Beach scene at Coney Island, Brooklyn, NY, 1928. Image courtesy of Bettmann via Getty Images. Back then, New Yorkers could flock to the Brooklyn beach for just five cents a subway ride — and flocked they did. On a hot day, beach attendance could reach as high as a million people, record numbers, no doubt. Dubbed “America’s playground,” Coney Island also happens to be the birthplace of frozen custard and roller coasters; today, it’s synonymous with Nathan’s hot dogs and the Mermaid Parade — all signs of summer. Acclaimed musicians Woody Guthrie and Ella Fitzgerald sang about the Brooklyn boardwalk and Walker Evans, the original street photographer, was one of many artists inspired by Coney Island. His well-known shot of a couple was taken the same year as the one above. Featured image courtesy of Raymond Boyd via Getty Images.